Bicycle accidents can be very devastating. 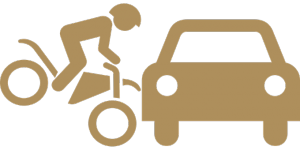 Bicyclists are not protected by a vehicle, and collision with a car can cause severe injuries. Cyclists are responsible to follow traffic laws and remain aware, and vehicle drivers are responsible to share the road with bicyclists and look out for them. It is important to remember that these accidents can be serious. On June 1, a bicyclist was struck by a vehicle in the Chinatown neighborhood. The incident was reported to police in Boston around 1 in the morning, and first responders were dispatched to the scene. Upon arrival, they found that the 60-year-old bicyclist had suffered from injuries. This individual was transferred to the hospital, but their injuries do not appear to be life-threatening. The vehicle involved remained at the scene on Washington Street and Kneeland Street. No further details were reported. Injuries sustained in bicycle accidents can be quite serious. Bicyclists are vulnerable, and impact with a vehicle can have catastrophic consequences. We strongly urge all drivers to remember to share the road with bicyclists, and we also ask bicyclists to remain cautious. Negligence can have severe impacts. We know how horrible some bicycle accidents can be as we often help the victims and their families who are struggling after these accidents. As dedicated members of the community, we want to raise awareness about the potential impacts of accidents. At the Law Offices of Jeffrey S. Glassman, we know that accidents can happen to even the most attentive drivers, so we are also here to help victims get assistance so they can focus on healing.